From dolphins giving handshakes to lemurs opening presents, take a look at the cutest pictures of the week! 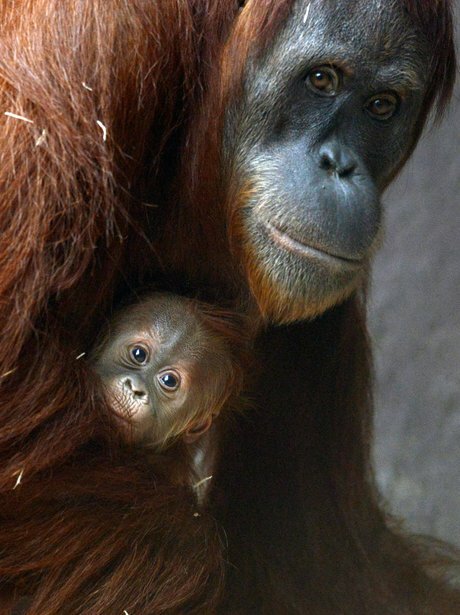 A mother orangutan holds her three-week-old baby at the Zoo in Prague. Altogether now: awwwwwwwww! Billy and Taffy, Whipsnade Zoo's ring-tailed lemur twins, receive their presents as they celebrate their 25th birthday. They're thought to be the oldest lemur twins in the world! Animals do the funniest things! Rosie the chimp waters her very own garden. Tupolo the chimp eats a leek after exploring her herb garden. yum! A suricat sits in the warming sun within their snow-covered enclosure of the Opel Zoo in Kronberg, Germany. Cute overload! Two polar bear cubs play in their enclosure at the zoo in Brno, Czech Republic. Is this one month old baby Rotschild giraffe at the Zoo in Prague smiling? 'Give us a hug!' A polar bear cub plays with its mother Cora in their enclosure at the zoo in Brno, Czech Republic. Pinscher Jule wraps up warm to brave the snow in Peitz, Germany. Tacoma, a 13-year-old Siberian tiger, strikes a pose at InSync Exotics animal preserve. Tigers have such magnificent fur! 'Pleased to meet you!' Cocoa the Atlantic bottlenose dolphin makesa friend at SeaWorld San Diego's Dolphin Point. These pups dressed up warm for a mass for San Lazaro! 'Now you see me, now you don't...' A swan blends into the snow at the Berlin zoo. It's feeding time for this full-grown moose cow at a moose farm in Duved, Sweden. This macaque monkey is allergic to the pollen from the cedar tree at Awajishima Monkey Centre in Japan so she has to scratch her nose. Bless! Playtime! These young wolves, Janosch and Alexander, play in their snow covered enclosure at the wildpark Eekholt in northern Germany.